There is something truly delightful about a big, messy burger, ketchup dripping on your hands, licking your fingers, the crunch of the lettuce, the bite of the onion, the fresh bun. And, of course, the crisp and oily fries alongside. Gourmet burgers (not the sorry excuse fast food restaurants serve) were something I truly missed when I first started cutting out factory farmed meat from my diet. I first rebelled against the hamburger in high school, after reading Fast Food Nation by Eric Schlosser. I just couldn’t handle the reality of what was in those patties. Nevertheless, I crave a good, saucey burger now and then. Finally, though, I discovered broiling. The burgers cook much better and, although the eating is a much messier job than a beef burger, they hold together fairly well. Best of all, I love the flavors and the possibilities for toppings are endless. I’ve made a list at the bottom of delights I like to pile on top, but I’m sure there are many more. How do you like your burgers? Give me some ideas! You’ll also definitely see one of my food hypocrisies coming out here: As I mention in My Food Philosophy page, I have a strong penchant for ketchup, despite its high sugar content. I love it. 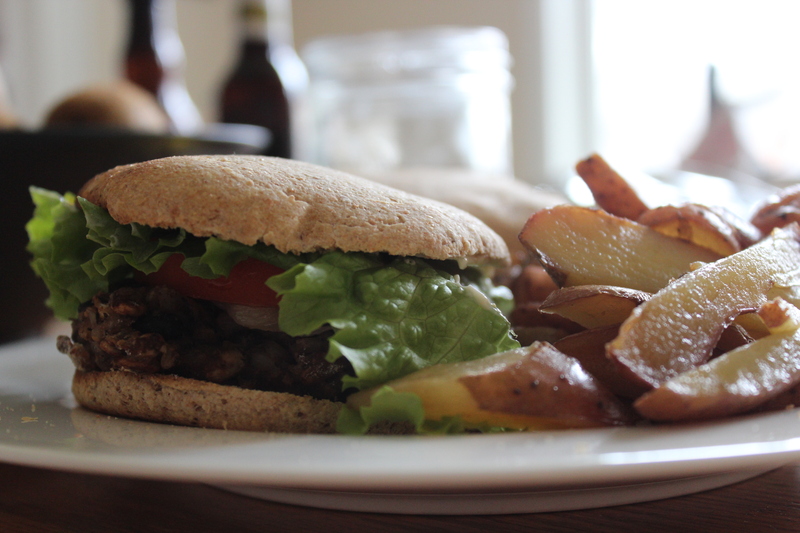 I can’t get enough of it on these burgers and the homemade fries I always serve alongside. I also go weak around barbeque sauce. Oh well. You certainly can use one of the healthier ideas I’ve listed below. I am not yet ready, however, to give up these sugary sauces. Also, you’ll notice I use saltines here. You could try substituting a multigrain cracker, but I would make sure it’s fairly absorbent, not a dry one like Wasa. I think these absolutely must be served with fries. You can easily make your own by slicing potatoes into wedges or thin fries, tossing with olive oil and salt, and baking on a cookie sheet on 375 F until tender and brown on the edges, stirring once or twice. Make sure you don’t crowd them on the pan too much, or they won’t get a nice brown crust. Mmm. I don’t usually get hungry as I write these posts up, but I could definitely go for a burger right now! Speed it Up: It’s actually best to make this ahead of time and refrigerate for a few hours before you form it into patties. If you’re like me, you’ll basically never have the patience or time to do that, so you can do what I do and stick it in the freezer for a few minutes and hope that will work. Generally it seems to do OK, although it’s harder to form the patties. You coud also certainly use pre-made buns instead of the recipe I have below. I don’t think I ever make the buns and the burgers on the same day. When I do make the buns, I make lots extra and freeze them to use later on. (You’ll notice the recipe for the buns yields 12 while the recipe for the patties yields only 4.) Also, this bun recipe is really just a pizza dough recipe (which I also like with barbeque sauce, as you can see here). Special Diets & Allergies: Vegetarian, vegan, dairy free, soy free, nut free. You could make these gluten free if you used another 1/4 C of rice instead of the saltines, which will still taste great but be a bit harder to form into patties. 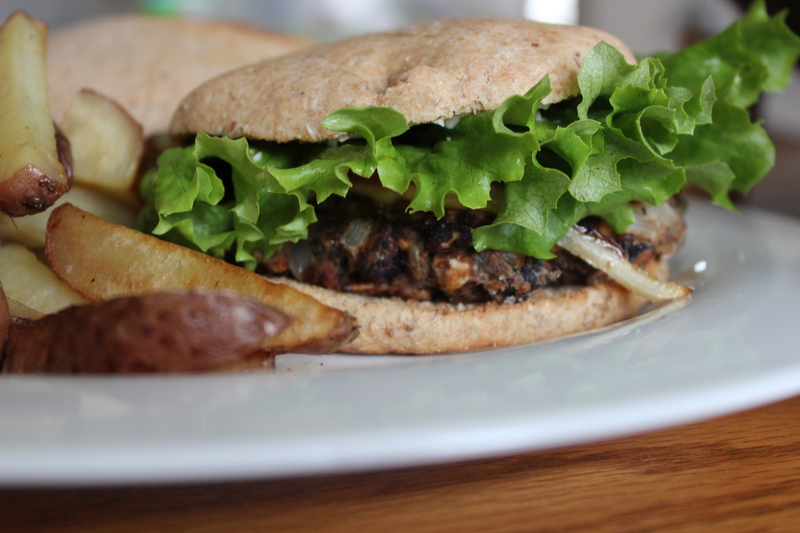 Also, use a non-wheat flour, like garbanzo bean or rice flour, to dust your hands when making he burgers. This healthy version of the all-American favorite is still a finger-licking delight. They’re sure to please a wide audience, from kids to meat lovers to vegans. Try serving them with a green salad and roasted potato wedges for a fabulous meal. You can use a multigrain cracker instead of the saltines, as long as it is fairly absorbent, not brittle. It’s easiest to form the bean mixture into patties when it’s been refrigerated, but if you don’t have time, go ahead and do it as soon as you need to. 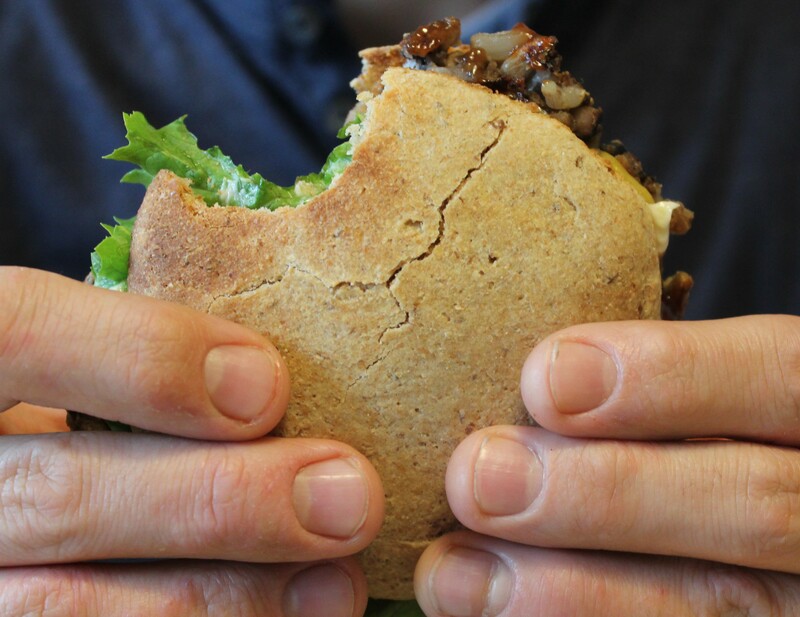 It’ll be harder to pat out, but will still taste great. Mix flaxseed and water and let sit for 5 minutes, or until gelatinous. Mix water and yeast and beat with a fork until foamy. Mix honey, oil, flaxseed mixture, and salt. Add 2 C flour. Mix. Mix in remaining flour, 1/2 C at a time, kneading once it gets too stiff to stir, until dough reaches a nice, elastic consistency. The dough should be soft, but not sticky. Let rise 1 to 1 1/2 hours until double in bulk. Punch down the dough and divide into 12 balls. Shape into discs. Place on a greased cookie sheet and bake about 6-8 minutes or until golden brown. Remove from oven and cool on a rack. Use immediately, let sit and toast before serving, or wrap well and freeze for up to two months. Drain the beans, reserving the liquid. Puree 2 C of the beans with 2 T of the bean liquid in a food processor or blender. Scrape into a medium mixing bowl. Add the other beans. Heat the olive oil in a small skillet over medium-high heat. Add the onion and sautee until tender, about 5 minutes. Add the garlic and cook, stirring constantly, another minute. Immediately add the cumin and cilantro and cook just another minute, stirring non-stop, until the cumin lets of its fragrance. Be careful not to let it burn. Add the onions to the beans. Stir in the sunflower seeds, saltines, and 1/4 C of the rice. If the mixture seems too moist, add another 1/4 C of rice. Let the mixture cool in the fridge for an hour. Remove from fridge. Turn the oven broiler on high. Sprinkle the bean mixture with flour and dunk your hands in some flour too. Form into burgers about 5 or 6″ in diameter. Dust the outside of each burger with flour. Spray one side of each burger with cooking spray and place, greased side down, on a cookie sheet. Spray the tops of the burgers with cooking spray. Place the cookie sheet about 5 or 6 inches under the broiler. Cook until the tops are browned, about 5 minutes depending on the strength of your broiler. Remove the cookie sheet from the oven, flip the burgers, and place back under the broiler. Cook another 3 to 4 minutes, or until the tops are nicely browned. Place each burger on a split bun and serve with desired toppings. Yum. I love homemade veg burgers! These are really similar to my favorite. I grind toasted walnuts instead of the sunflower seeds and use cornmeal instead of the saltines. The broiler is a great idea! Topping? Tofu aioli with chipolte powder mixed in. 🙂 Thanks for another great post. Mmm! I have done chipotle peppers pureed with Smart Balance mayo, but it seems too hot for everyone in my family! I like it a lot though. I LOVE these buns! I can’t believe how long it took me to figure them out. I’ve also used this recipe to make bread sticks, but the buns are my favorite. I’m so glad you tried them, and thanks for the note!